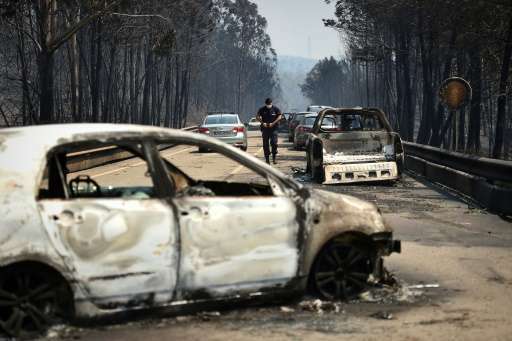 Highly exposed to global warming's climate-altering impacts, Portugal is likely to see more massive forest fires such as the one—still raging—that has killed at least 60 people this weekend, experts say. The Iberian peninsula encompassing Portugal and Spain is experiencing a warmer, drier June than usual, explains Thomas Curt, a researcher at France's Irstea climate and agriculture research institute. Added to that, the country has vast expanses of highly inflammable plants, including forests of pine and eucalyptus trees. "Hotter air is synonymous with drier and more inflammable vegetation," said Curt. "The more the mercury climbs, so does the risk of fires and their intensity." Temperatures in the region have warmed by more than the global average over the past half century, according to a 2014 review of climate change impacts on Portugal. Heat waves have become more frequent, and annual rainfall slightly less, said the review published in the journal WIREs Climate Change. More frequent and pronounced heat waves are expected in future, accompanied by a "substantial increase" in fire risk—"both in severity and in length of the fire season," it said. Does global warming boost forest fire risk? "It is certain—we are experiencing a rise in temperatures," said Curt. The Northern hemisphere summer has lengthened over the past 50 years from July-to-August, to June-to-October now—meaning a longer fire risk season. 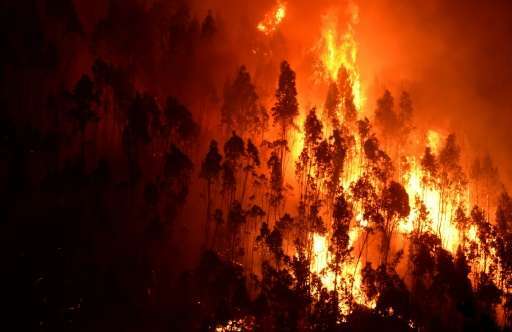 There has been an increase in major fires of more than 100 hectares, and so-called "megafires" of more than 1,000 hectares, the researcher added. "It is truly a growing problem everywhere in the world, and notably in Mediterranean Europe." These mega blazes remain rare—only about 2-3 percent of all fires—but are responsible for about three-quarters of all surface burnt. "Many analyses of climate change show that these major fires will become more and more likely," said Curt. In the short term, reinforce firefighting capacity, deploy patrols, set up watchtowers to raise the alarm, and ban fire-making everywhere. Over the longer term, human settlements and green areas will need to be substantially redesigned, experts say. Some forest will have to be cut back, undergrowth cleared, and residential areas moved further from scrubland and forest borders, to reduce the risk to life and property. "The focus of efforts should shift from combating forest fires as they arise to preventing them from existing, through responsible long-term forest management," green group WWF said. "Responsible forest management is more effective and financially more efficient than financing the giant firefighting mechanisms that are employed every year." In the yet longer term, added Curt, "of course, we need to curtail global warming itself."